Rangers defender Karl Svensson has signed for newly-promoted French Ligue 1 club Caen. 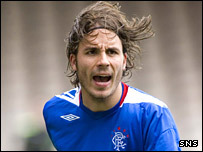 Svensson was one of former Gers boss Paul Le Guen's signings, but was not part of Walter Smith's plans. He has signed a three-year deal with the French club after completing his move for an undisclosed fee. Meanwhile, Rangers have signed Kilmarnock goalkeeper Graeme Smith. Smith has signed a three-year contract at Ibrox and will compete with Allan McGregor for the goalkeeper's jersey.